The forbidden book of banjo secrets! Click here for free preview of the contents of the book. 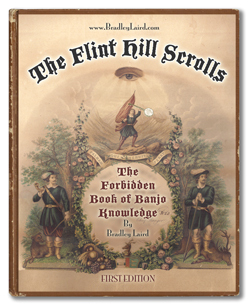 Note: For those of you familiar with my book Mandolin Master Class, read by thousands of mandolin players, you will be pleased to know that The Flint Hill Scrolls covers a lot of the same territory but it written specifically for banjo players. I didn't just use search and replace to change "mandolin" to "banjo"! It is a completely new book with a lot of information that is pertinant only to the 5-string banjo. By the way, at the risk of my reputation as a mandolin player and teacher, I must confess that I started on the banjo one year before I got a mandolin. That was back around 1974 and I am still a confirmed banjo nut! The Flint Hills Scrolls is AWESOME! So is the video that came with it. The 3 chord shapes with the skip 2, then skip one lesson is priceless. Whether you have been playing 10 days or 10 years, this book was written for you. Instead of simply thinking "put finger here, here and here and pick" you'll begin to understand why you put your fingers there, there and there! And that information has a powerful multiplying effect on your playing. I like to compare it to this: Let's say you memorize a poem in French but you don't speak French. You could recite the poem perfectly but you wouldn't know what you are doing and couldn't write one simple sentence in French. The same idea applies to the language called music. Read the book and learn the language. The language of music... banjo style! 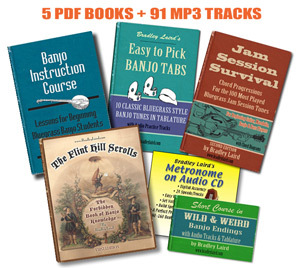 The only requirements are that you understand the basics of banjo tab and know a few chords and have a desire to learn and explore. The banjo will make a lot more sense after you read this book. This unique book takes you on a journey of exploration and will decode a lot of the musical mysteries of banjo picking and navigating the fingerboard. This is the most painless music theory for banjo you'll find. And it's a lot more than just that. Easily locating every chord on the banjo... really! Take a look at the free preview for a better idea of everything the book contains. As Bradley puts it, "If I could sit with a banjo picker for a weekend, and they had a lot of questions, this book is a script for what I would share with them." The book includes copious chord charts, diagrams, tables and tabbed out examples of scales, chords, backup licks, lead solo licks, and even a few cartoons. The book also contains 6 self-tests (with the answers at the end) to be sure you understand the material. The download includes the eBook "The Flint Hill Scrolls", the workshop video presentation, and--just to make it complete--a PDF of the handout I used the day of the workshop. Have fun! This is probably the best value anywhere in terms of banjo knowledge! 107 page Printable PDF file format eBook plus the complete workshop video presentation. To order DIGITAL version of Bradley Laird's "The Flint Hill Scrolls" click the button below.